Will Jay Leno Follow Conan O’Brien Out The NBC Door? Looks like Conan O’Brien is not the only NBC late night talk show host who’s mad at the peacock network. News is hitting the wires today that Jay Leno is starting to entertain the idea of leaving NBC. Sources close to the deposed king of late night tell Popeater Jay is ‘furious’ at how both he and Conan have been treated by the intellectual pygmies who caused this whole mess, and is even considering leaving the network to find pastures new. At this point it’s really anyone’s game and pretty much anything can happen. Bottom line, this is all about ratings and money. NBC wants all of it all of the time and they clearly don’t care how it affects the people involved. 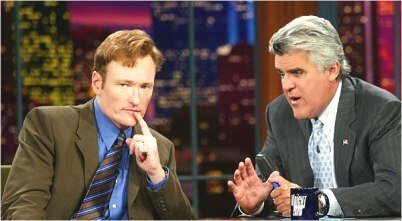 A few days ago I figured Jay Leno had his hand in this switch, but now I’m thinking that maybe he was just as blind sided as Conan was. What will happen to the world of late night if both Conan and Jay leave? 53 queries in 1.136 seconds.